Put very simply; the Renault Megane Sport Tourer Estate is a practical and affordable mid-sized family car that isn’t actually as sporty as its name would suggest. Make no mistake; it looks good, but it puts comfort before entertainment behind the wheel and is more safe than playful. If you’re on the lookout for a family Estate that houses a high-quality interior, a solid line-up of engines and lots of space, this car is well worth a test drive. OSV takes a closer look at what it’s all about with our Renault Megane Sport Tourer review. Quite why Renault christened this car a Sport Tourer is anyone’s guess as the name is terribly deceiving. This is not a sporty car by any stretch of the imagination and is actually more of a slippers and pipe comfort car. There is a racier GT Line available, but ride quality is reduced thanks to overly firm suspension. The GT 220 variant does offer a more powerful engine, though. Put your foot down, and you might find this Renault Megane ST Estate is hard to keep a hold of, and winding, bumpy roads, in particular, will demand a lot from your years of on-the-road experience. If you like a challenge while getting your shopping from A to B, this will certainly provide one. There is a quartet of petrol engines on offer to start with, with the 1.2-litre 113bhp TCe unit kicking things off. It’s pretty economical, but it takes 11 seconds to get from rest to 62mph. Keep it at low speeds around the city, though, and it will actually feel pretty darn good. The same engine is available in 128bhp guise, too, and takes 10 seconds to cover the 0-62mph sprint. If it’s performance that you really desire, the 2.0-litre GT220 is a good option and can haul your car from rest to 62mph in a matter of 7.6 seconds. For an Estate of this size, that’s pretty impressive. There are also a pair of diesels to choose from, too. The less powerful of the two is a 1.5-litre 108bhp dCi which is super slow, but also super economical. But while it will save you cash at the fuel pump, it’s not very good at pulling heavy loads which is what you need your Estate to do. The other diesel is a 1.6-litre 128bhp unit that can get you from rest to 62mph in 10.1 seconds and feels a lot mightier. Generally, cars in this sector are either fun or they’re comfortable, and this one is really comfy. The cabin is nicely insulated so that little wind and road noise seeps through, and interior comfort is generally very good. Renault’s interiors have been getting better and better with each passing year, and this one is also much improved. The dash is forged from slick, soft-touch plastics and feels and looks better than past Megane’s. The seats are supportive and comfortable, and if you opt for the GT Line model you’ll also benefit from sports seats. The Megane ST Estate is of a similar size to the VW Golf Estate but it’s smaller than the Skoda Octavia Estate. Practicality is decent, and three rear seat adults should be able to sit comfortably even on longer journeys. Visibility is good, while the 524-litre boot is one of the biggest in its class. It also comes with a false boot floor for your valuables, while the vehicle can tow weights of up to 1,600kg. 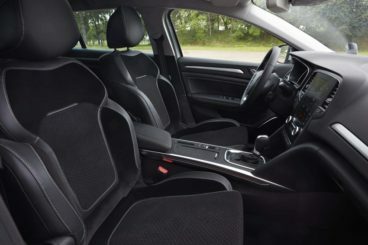 Standard equipment across the range is very good, with 16” alloys, front fog lights, USB connectivity, Bluetooth connectivity and air conditioning coming as standard even in the entry-level model. The mid-level Dynamique TomTom adds in automatic wipers and lights, twin-zone climate control, satellite navigation, 17” alloys and an upgraded stereo system. The GT220, meanwhile, throw in a bodykit, carbon detailing and a different alloy wheel style. There isn’t a massive list of optional extras, but on the list is a TomTom sat nav for £110, as well as an R-Link multimedia system for £300. In terms of running costs, the 1.5-litre dCI diesel is the cheapest to run and can return 80.7mpg off a sensible drive. If you fancy a bit more power but still want to keep costs down, the 1.6-litre Ci is a solid option that is quick and can return 70.6mpg. It’ll cost you £20 per year in road tax. The engine’s don’t fare terribly, with the 1.2-litre the most frugal. It can return 53.3mpg and will set you back £30 a year in road tax. Residual values is a big weakness, and the Renault ST Estate won’t hold its price after three years as well as some of its competitors. On Contract Hire it would cost £170 to £300 depending on the model on a 3-year agreement, which represents great value. It’s not easy for designers to strike the right balance between load-lugging capability and handsome looks, but Renault has managed to pull it off here. Usually, a small Estate like this is either big and awkward looking, or it’s slick but a bit too small. Here, you get the best of both worlds. There is a surprising amount of petrol engines on offer here – four in total. Compare this with most of its rivals, and you’re spoiled for choice. Few consumers pair a sizeable car like this up with a petrol unit, granted, but the 2.0-litre GT220 is especially desirable. It’s got a quick turn of pace and plenty of power, but it can only return 38.7mpg. For a family car, that might not be good enough. Then again, it’s all about priorities, right? The interior is clean, smart and comfortable. It’s a big improvement on its predecessor, and is overall a genuinely pleasant place to be. It isn’t as upmarket as some of its rivals, but everything is well-assembled, and it’s all logically arranged. This is a Sports Tourer. So why doesn’t it drive like a sports car? It’s easy to get fooled by the name, but this is far from being a performance car. The suspension has been developed so that it offers comfort, and while it’s easily the smoothest car in this class, it isn’t an agile handler. If you were drawn here because of the name, you might want to take a closer look at a genuine performance car, such as the SEAT Leon Sports Tourer. The engine line-up is big, and it’s varied. But it’s also lopsided. There are some strong power plants available, but there are also some entry-level units that just don’t have enough steel to pull you on a full load. Pack your car out with luggage and people, and some of the engines will struggle. Despite the brands reputation for safety and reliability, the Sport Tourer Estate scores poorly here. 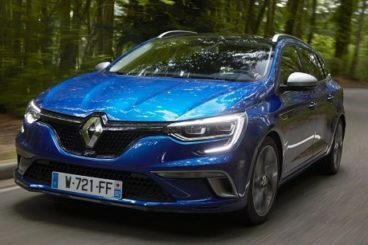 Before you make a final decision, let’s take a look at how the Megane measures up against some of its closest rivals in the comparison section of our Renault Megane Sport Tourer Estate review. The Ford Focus Estate is surprisingly not as popular as you might assume, with buyers favouring more stylish models. But while it sports a rather plain exterior that can’t rival the Renault’s, it would be remiss to overlook its strengths. For one thing, the Focus Estate is easily the most fun car to drive in this class. While you might be tempted to put drivability towards the bottom of your priorities when shopping for an Estate, fun on the road helps you enjoy your vehicle that little bit more. Although the Estate isn’t as entertaining as the hatch from which it’s derived, it’s still a good sport. And it’s certainly sportier than the Renault Megane “Sport” Tourer. 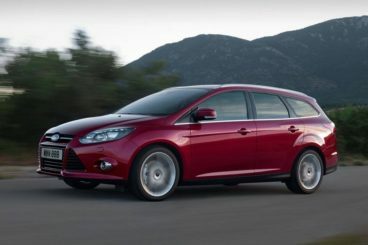 Another of the Focus Estate’s strengths is its strong line-up of engines. Whereas the Renault’s canon is let down by too many feeble units, the Ford is rich with flavour, power and performance. The petrol engines are enhanced by EcoBoost technology, which helps to keep running costs down, while the diesel range borrows largely from the hatch. Its weaknesses? Well, it isn’t the most practical in this class. Its 476-litre boot is considerably smaller than the 524-litre one found in the Megane Estate, and it doesn’t come without the bonus of an intelligent flat folding seat system. Apart from that, there are a few storage systems dotted around the place, while build quality on the whole is good. Its biggest weakness, though, is that it can’t hold its value very well. After three years, it depreciates more alarmingly than the Renault. 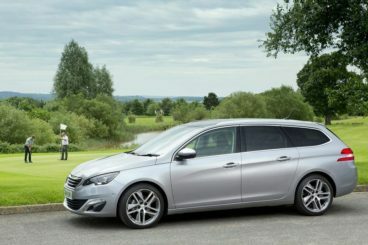 The Peugeot 308 SW Hatchback was really well-received when it was first released, but how does the Estate fare? And is it worth your money over the Renault? For one thing, the 308 SW Estate is only slightly longer than the hatch – it’s got about a foot extra in length. Despite this obvious misgiving, it actually has a larger boot even than Estates in the class above it, such as the BMW 5 Series Touring. How big is the boot? 660-litres. It’s practically as big as an egg laid by Godzilla, and dwarves the one in the Renault. But it’s all about what you need, and certainly not every buyer is going to need some gargantuan luggage space. Moreover, because of the sizeable boot, the Peugeot Estate doesn’t offer a great deal of rear legroom or headroom. Taller adults will be especially uncomfortable in the back, a situation that is further compounded if you opt for the panoramic sunroof. Interior space, then, is something of a bugbear, while practicality is hit and miss. The interior itself, though, is better crafted than the one in the Megane Estate. The suspension is enough to keep you comfortable even on longer journeys, while the dash is a much less cluttered affair than last time around. However, the touchscreen is not exactly user-friendly and might take some time getting used to. Both these cars look smart, and they both drive well. The Peugeot can offer a better, more interesting and useful range of engines, and it’s trump card is arguably its low running costs. Although the cheapest unit to run in the Megane’s range returns a mercurial 80mpg, its counterpart in the Peugeot returns an astonishing 88.3mpg. The pricing is keen, the interior is well groomed and fresh, and there is a good amount of standard equipment available. The name is super deceiving, because this Estate is far from being sporty. Apart from that, there is a lot to love here for young families who are making the step up from a hatchback. It easily rivals some of the big names in this sector, including the Ford Focus, and looks as good as any competitor. The Renault Megane Sport Tourer has its flaws, but it’s a sound investment.